If you’re dealing with Android apps you won’t be able to escape the term “Real Multitasking”. My question is: Android is all about multi-tasking, so what’s this “real” multi-tasking all about? Sounds to me as though Android’s multi-tasking aspect is rendered even easier to use: that means jumping around between running apps, fast access to apps and links without having to go via the homescreen, etc. SwipePad Beta is an app that seems to be able to provide users with said service… that’s what the comments in the Market suggest, anyway. Read on to see our take on this app. Please note: we very rarely award a full 5 star rating! They’re as rare as falling stars in a summer sky. If you we give an app 5 stars (or you feel it deserves such a stellar rating), inform your buddies, colleagues, and neighbors, they’ll love you for it! 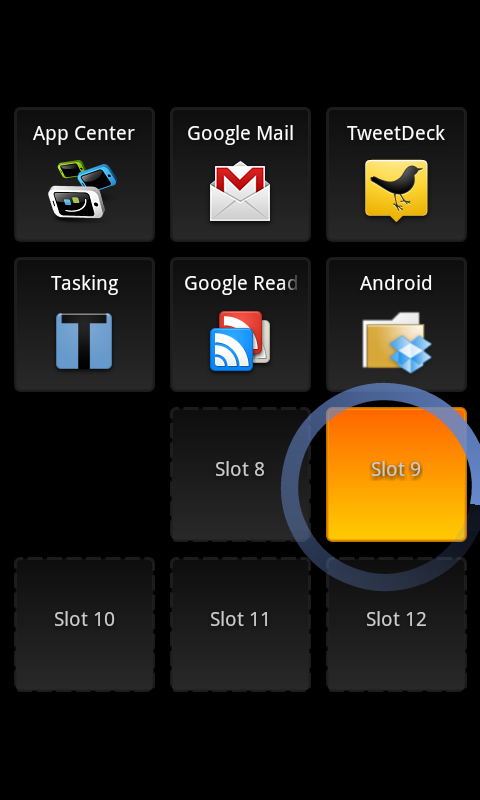 SwipePad Beta comes with 12 slots which enable fast access to apps and shortcuts. The app can be started up from within any running application—all you have to do is swipe across the display (more infos in the Screen & Controls section). The big advantage to using this app is that you don’t have to navigate back to the homescreen every time you want to do an action, e.g if you need to look up an appointment whilst writing an email. Of course this can only work if you’ve allocated your calendar app to one of the slots. Once you’ve looked up the appointment you can simply hit the back button in order to return to your email. Ultimately you may only be saving two clicks (rather than hitting homscreen, calendar, long click on home, back to homescreen, back to mail app…), but that’s what “Real Multitasking” is about. SwipePad Beta can also serve as a good fast access app. 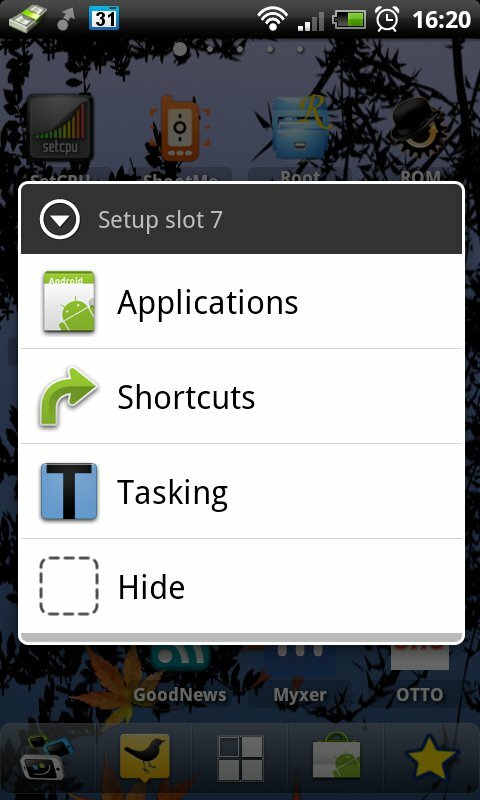 You can reach apps and shortcuts very easily via the slots. There is a plugin available for SwipePad Beta, but you have to pay for it. The plugin lets add a “Tasking” feature to a slot and will let you access the last applications you were using. Seeing as you can basically achieve the same thing by pressing down on the home button for a bit I would say that the context menu – which also comes with the Tasking plugin – might make more sense. This menu lets you forward the market link of whichever app you happen o be using, as well as access the market description page of said app, read up on user instructions, or stop or uninstall an app. Opinions differ about this type of “Real Multitasking” apps that can be accessed without banishing other running apps to the background. Some think they’re the bee’s knees, others don’t see the point. I wasn’t convinced from the very start but can now safely say that these types of apps are amongst my top ten on every one of my devices… which is why checking SwipePad Beta out might make sense for your, even if you don’t (yet) get the whole thing. SwipePad Beta is a useful app, though there are other, similar apps out there that have more to offer (e.g. widgets). If you’re interested in fast access to links and/or “Real Multitasking” give SwipePad Beta a go—it’s free! Swipe across the screen from the outer corner towards the middle of the display in order to activate SwipePad and access the 12 slots. Press down and the SwipePad will open. You can then a lot links to slots by swiping or else access the apps you’ve already linked to slots. If you touch an empty slot the context menu will pop up; use the context menu to add the Tasking plugin to an empty slot (you have to buy the plugin). It took a few failed attempts until I managed to open the SwipePad up successfully. 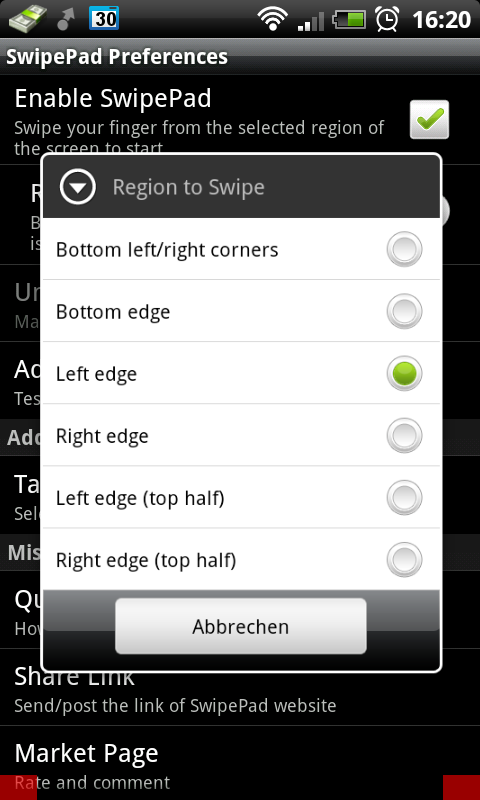 You can determine the spot from which you have to swipe towards the middle of the display under settings (i.e. the left margin or the left and right corner on the lower margin). A brief haptic feedback informs you that you’re pressing on the right spot, but I had a few mishaps nonetheless (like highlighting an entire email rather than grabbing the SwipePad). Long story short: practice and skills are required if you want to master the controls. I had some issues trying to open up the SwipePad. Practice makes perfect, as we know, but I sometimes still get it wrong. Aside from that hiccup the SwipePad Beta’s controls are great. SwipePad Beta performance was very good overall. It ran a bit slower when animations were switched on. SwipePad Beta can be downloaded free of charge from the Market. Thanks for the feedback, you two, and glad the review was helpful! Thanks for the review, nice app!